Have you ever been kept awake by a churning mind? Have you felt stressed due to the non-stop chatter in your brain? Have you ever just wished you could SHUT your brain OFF…. for just a minute….? Most of the time when we try to fight our monkey mind, we end up stuck in a vicious cycle where our churning thoughts end up taking all our focus and as a result we just get more and more wound up and stressed by the thoughts that we feel like we can’t control, can’t catch. or process. They seem to keep going round faster and faster…. If we simply try to STOP the thoughts, it just draws more attention to them, and we end up making it worse! Distractions can work, but only for so long. 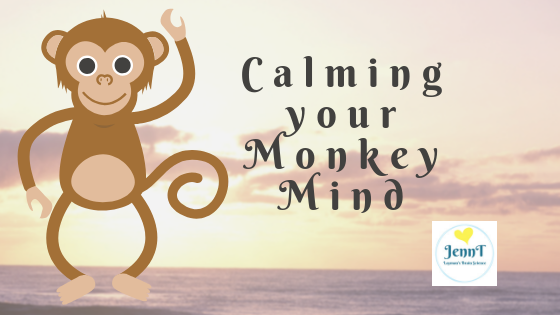 I also feel like it’s just that ….. a distraction – it’s not a fix to calm the monkey mind!